Attempts to ban burkini-clad women from the beaches of France’s Riviera coast suffered a further setback when a judge in the city of Nice declared the prohibition of the body-hiding swimwear to be illegal there. The verdict delivered on Thursday was the latest of several rulings against bans imposed by local authorities in dozens of southeastern beach resorts in the peak holiday month of August – bans that sparked intense controversy inside and outside France. Nice, where 86 people died in an Islamic State militant attack in July, was one of some 30 towns in the largely right-wing part of the country to ban the burkini on the grounds that it presented a threat to public order. The burkini, which is predominantly worn by Muslim women and covers all of the body bar face, hands and feet, has become a target at a time when identity politics is gaining traction following a string of deadly Islamist attacks in France. The bans have exposed secular France’s difficulties grappling with religious tolerance in the wake of the attacks. Nice became a symbol of the burkini-ban controversy when local and foreign media relayed pictures of police ordering a woman lying on the beach to remove some of the clothing that covered most of her body. 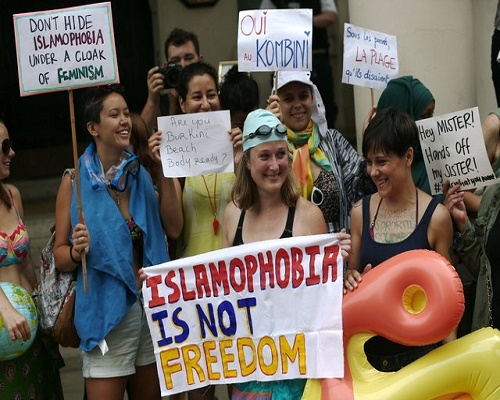 The United Nations human rights office earlier this week called on French beach resorts to lift their bans on the burkini, calling them a “stupid reaction” that did not improve security but rather fuelled religious intolerance. While the controversy may wane with the end of the summer vacation period, the burkini furore highlighted the tensions set to dominate ahead of elections next May. While traditionally Catholic but also home to large Jewish and Muslim communities, France has made the strict separation of church and state a cornerstone of political life for well over a century.